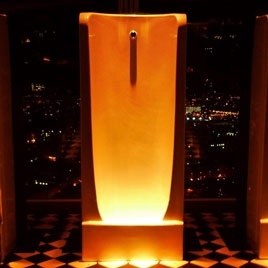 The first deliveries of our new long-awaited Niagara floor standing urinal have been made to Eton College, the Chancery Court Hotel (Covent Garden) and to The Shard. The new Healey & Lord Niagara urinal is handmade in England from fireclay using techniques over 100 years old. To meet growing demand we have also fabricated glass urinal splash-guards bespoke to the Niagara for functionality and to complete the traditional Art Deco look; both urinals & glass splash guards are now available from stock.